Garden Terrace team member Elaine Goldberg (centre) is pictured here receiving the home’s Everyday Hero Award during a Nov. 8 ceremony. Elaine Goldberg’s colleagues at Garden Terrace describe her as a helpful member of the Kanata long-term care home’s environmental services team who is highly organized and always carries a positive attitude. It’s for these attributes that Elaine was named Garden Terrace’s 2018 Everyday Hero. 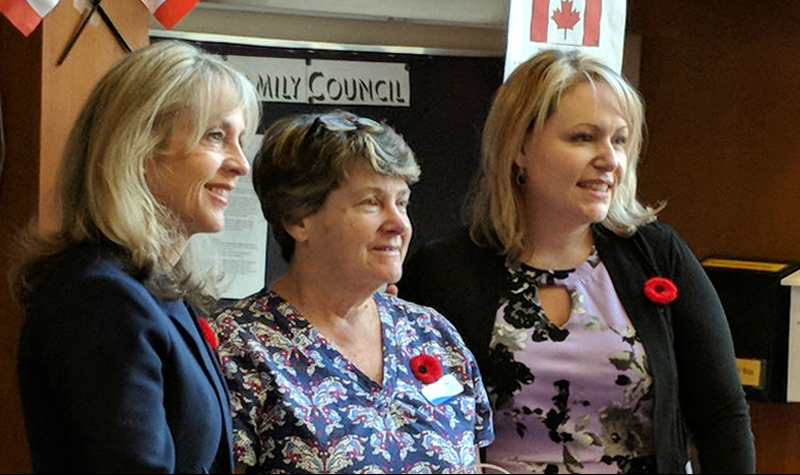 Elaine and other Circle of Radiance award recipients were honoured at a Nov. 8 ceremony at the home that was attended by residents, staff members and Kanata-Carleton MPP Merrilee Fullerton, who helped present the awards. Environmental services manager Etienne Bourbonnais commends Elaine’s organizational skills and her ability to help residents recover lost items. If a resident is missing a piece of clothing or another item, Elaine is immediately on top of the matter, Etienne says. “She goes above her scope by informing managers when clothing is missing before the resident even realizes the article is misplaced,” he says of Elaine, a 15-year employee at Garden Terrace. What strikes life enrichment co-ordinator Sylvia Monette about Elaine is her infectious smile and the kind words she always has for others. Garden Terrace office manager Karen Paquette also cites Elaine’s organizational skills, willingness to help others and friendly disposition as her key strengths. “She is a dedicated employee,” Karen adds.